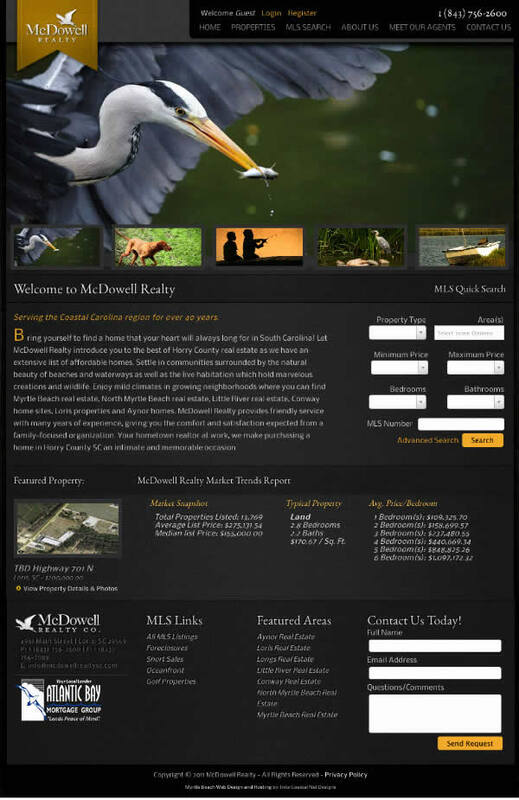 We are pleased to welcome McDowell Realty with the launch of their new website designed by our professionals at ICND. Licensed in both North and South Carolina, McDowell Realty serves Horry, Georgetown, Brunswick, as well as Columbus Counties. With over 40 years of servicing the Coastal Carolina area, McDowell has worked hard to build and maintain strong community ties. We met with McDowell Realty to get a sense of their company, learn what target area they wanted to reach, and discuss their business goals, then we designed and built a new site from the ground up, integrating MLS 3.0 and all of its latest features. The featured area pages on their site utilizes relevant and SEO-friendly content that ensures excellent placement in search engine results. McDowell Realty is among the rising numbers of SEO clients with ICND which offers ongoing optimization and improvements to their website increasing the percentage of success with leading search engines. McDowell Realty specializes in a variety of real estate, including residential, commercial, investment properties, as well as land and farms. They’re a small, locally owned and operated company with southern hospitality, a high standard of ethics and a strong belief in exceptional customer service. At McDowell Realty they put your needs first; they tell you they will help you find a home, not just a house.